Negotiating with Donald Trump means entering into the principle of uncertainty. Mexicans know it, and now China is discovering it. Just 10 days after declaring the cessation of tariff hostilities with the Asian giant and in an unexpected setback, the White House announced that it will continue with its intention to impose tariffs of 25% on imports from China worth 50,000 million dollars. This decision, which caught investors and the Xi Jinping Administration by surprise, comes after the alleged relaxation of commercial tensions between the two economies and just before the US Secretary of Commerce, Wilbur Ross, travels to Beijing next June 2. The pressure is evident. Next Saturday, Secretary of Commerce, Wilbur Ross, arrives in Beijing. The tariff roll gives him more bargaining chips and, in passing, it reminds the Chinese President Xi Jinping, the dangerous path that would be opened in case of a failure in the resumed talks with North Korea; a double thrust that reveals the essence of the Trump method. In his negotiating manual, the New York tycoon has always privileged positions of strength. Pressing and hitting are part of his strategy. "There are times when the only way out is confrontation. When someone treats me badly or unfairly, my response, all my life, has been to strike back as hard as possible," he wrote in The art of the deal. "To protect our national security, the US will implement specific investment restrictions and strengthened export controls for Chinese people and entities related to the acquisition of significant industrial technology," the White House note said. "The US will continue its efforts to protect domestic technology and intellectual property, stop non-economic transfers of significant industrial technology and intellectual property to China, and secure access to the Chinese market," the statement added. Trump, like most of his fellow citizens, considers that the Asian giant has taken advantage of the opening of the US markets, while shielding its own. The result of this has been a trade deficit of 375,000 million dollars, the largest in the world. The reduction of this imbalance supposes a crucial objective for Trump, especially in a year in which legislative elections are celebrated (in November the whole House of Representatives and a third of the Senate are renewed). Despite this political urgency, the need to seek Chinese support for the nuclear strike against North Korea delayed the start of hostilities. This was acknowledged by Trump in public, and it was only when he had secured the support of Beijing, when the commercial pulse started. The first blow was given last March. 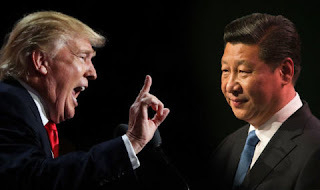 After leaving in suspense the tariff offensive with Europe (153,000 million deficit), the United States imposed tariffs on China of 25% on imports worth 60,000 million. Chinese President Xi Jinping did not hesitate to respond with a similar measure. The battle made the markets stop breathing. They were facing two countries that represent 40% of world GDP. Although the most radical sector of the White House, led by the Minister of Commerce, Peter Navarro, advocated an open war, the shock was muffled two weeks ago. The tariff increase will be finalized on June 15 and the restrictions on investments in the technological area will be announced on June 30. This will gives margin to Wilbur Ross to cool the mood again and even use the sanctions themselves as a negotiating weapon. "We want China to withdraw all its trade barriers and to have reciprocity between the two countries. The discussion will continue on these issues; the US desire is to increase its exports by eliminating the severe Chinese restrictions on imports," the White House indicates. The tariff increase, in parallel, reinforces the US position before the resuscitated face-to-face that Trump wants to celebrate on June 12 in Singapore with the North Korean leader, Kim Jong-un. In Washington it is understood that the rejection gestures that the North Koreans exhibited two weeks ago and that ended with the break of the meeting were adopted under the influence of Beijing, eager to show its muscle and force an improvement in the commercial negotiation. Before this stake, the message is clear. China, the great godfather of Pyongyang, must support the US; otherwise there will be tariff war. It's Trump negotiating. Meanwhile, China's Ministry of Commerce expressed its surprise at a new measure that it considered contrary to the consensus that both parties had reached and recalled that, regardless of the measures taken by the US the Asian giant has the capacity to defend the interests of its people. For its part, the spokeswoman of the Chinese Foreign Ministry, Hua Chunying, considered that the US decision is "contrary to the consensus" that had reached and stressed that, in international relations, "every sudden change" simply "diminishes and squanders the credibility of a country". After urging Washington to keep its word and work with China "in the spirit of the joint statement," this official spokeswoman declared that Beijing "does not want a trade war, but does not fear one." The Chinese state newspaper Global Times issued a warning similar and assured that the USA "suffers delirium" that makes it feel "strong enough to force other countries to accept its unreasonable demands". Likewise, that newspaper considered that Washington does not seem to understand "the difference between a commercial and a real war" because, although the second can be won without casualties, "the same would not happen" in the first case.